The silence has been broken. Mickey Mouse is now talking with guests at a meet-and-greet at Walt Disney World. The iconic character, which speaks in a high-pitched voice in movies, TV shows and on theme-park stages, historically has been mute during one-on-one encounters and photo opportunities with park visitors. Now, at the Backstage with Mickey Mouse attraction near the entrance of Magic Kingdom, he speaks, the company announced through its Disney Parks Blog on Monday. 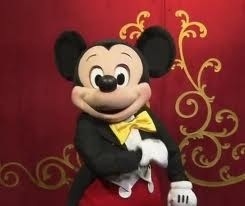 A video with the blog post shows Mickey, dressed as a magician, chatting up visitors in familiar tones with several stock phrases, including “Well, hi there,” “Come on in” and “Could I sign that for you?” The character also engages folk in a longer bit that includes “I’ve been working on a magic trick. Can you help me out? … Pick a card, any card.” Mickey’s mouth moves in sync with the words; he also blinks. Backstage Mickey, which opened in 2011, is located in the Town Square Theater at Magic Kingdom. It’s an indoor, controlled atmosphere. It was the first meet-and-greet at Disney World to offer a FastPass option. The talking Mickey is a permanent fixture at this location and not just part of Disney’s Limited Time Magic promotion, a company spokeswoman says. Kids are going to love that !